The Echoflex Contact Input Interface offers four wired inputs to interface with Echoflex wireless control devices. Each input has two terminals (+5V, Input) for interfacing with almost any equipment creating a hybrid control solution. When the two terminals are bridged through an external dry contact, the input triggers transmission of a telegram based on standard profiles (EEP). Each channel can then be linked to the same or different receivers so when the input is activated, a wireless telegram is sent representing the input’s state. 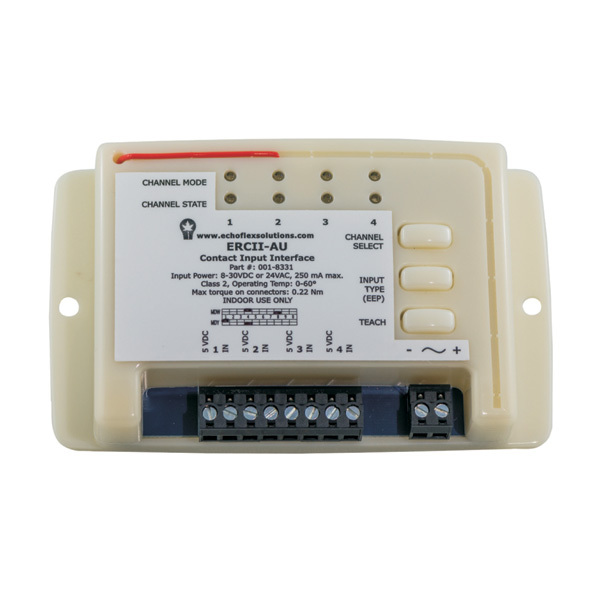 The Contact Input Interface is a simple method of integrating wireless devices into existing panels, wired control systems, or energy management systems.